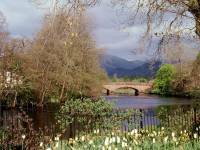 I spent the Mayday weekend of 2002 in Callander, Stirlingshire. 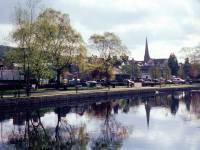 The town lays just to the east of the Trossachs, right on the Highland boundary fault and within the newly established Loch Lomond and the Trossachs National Park. 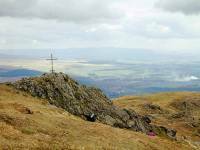 The weather was good and I was able to complete both planned walks; climbs of Ben Ledi (2883ft), and Stuc a Chroin (3199ft). 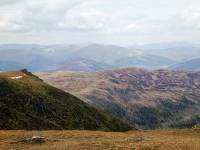 With their neighbour to the north, Ben Vorlich, these mountains are visible from much of central Scotland and I was anticipating some splendid views. 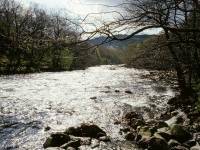 Ben Ledi is just three miles northwest of Callander and makes a satisfying and easy expedition from the town. 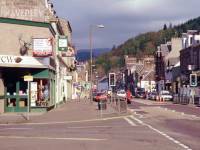 Callander's main street around 9am on the Saturday morning. Ben Ledi, its top in cloud at the moment, can be seen directly in line with the street to the west. 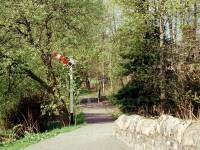 One of the town's bridges over the river Teith from a stretch of adjacent parkland. 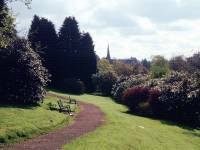 The parkland between Callander's town centre and the riverbank. 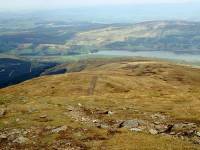 I'm starting my walk to Ben Ledi from the park. 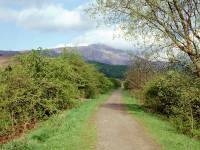 The walk proper starts here, as I join a cycle track routed along the bed of the old Stirling to Oban railway line. One of the signals is still in place, nearly forty years after the line closed. The old railway track runs out through river meadows west of the town. 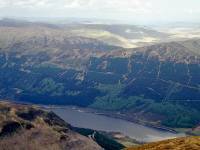 The cloud is beginning to lift from the summit of Ben Ledi and a fine day is in prospect. 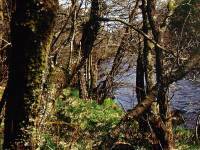 A pleasant stretch of open woodland is reached after the A821 road crossing. 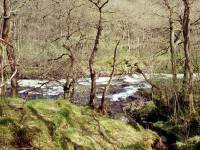 The old railway arrives at the Falls of Leny, a series of rapids formed as the Garbh Uisge (which is Gaelic for "Rough Water") runs through a narrow gap in the hills. 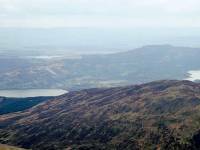 We're more or less at the Highland Boundary Fault here. Another view of the Falls of Leny. 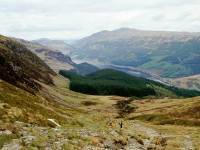 The scenery just short of the car park from where the path to Ben Ledi climbs through the woods. A problem. 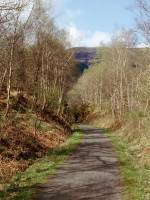 The Forestry Commission are felling trees and have closed the main path to Ben Ledi. 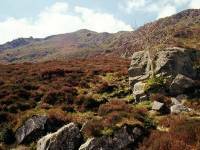 They have requested walkers to follow an alternative path to the summit and have signposted the new access point from the cycle track, but have not seen fit to post a map and helpfully state that there is "no waymarking on the hill". My map shows no other track. I'm in a maze of forest rides and logging tracks. What to do? 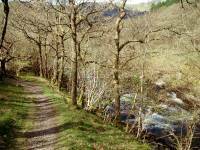 The paths lead into the corrie of Stank Burn, northwest of Ben Ledi. I've decided to follow the path as far as I am able but it's petering out and the terrain is becoming rough and boggy. Looking up at the ridge. I've spotted a grassy rake ahead (not seen in this photo) that looks as though it might give me relatively trouble free access to the ridge, but the terrain is becoming steep and tiring. This is my first proper climb for a year and I'm hopelessly unfit and feeling the effort quite badly. More walkers come up behind me but pass below, and it becomes obvious I've missed the main route and am now on a trackless slope. I take my time and make my way towards what appears to be a reasonably defined path, not shown on any of the maps. As I reach the col, a magnificent view is seen to the northwest. A view to the north, along the gap of Strathyre, and I believe I'm looking at the 3983ft summit of Ben Lawers, still snow-capped in early May. From the col I'm labouring up the ridge line towards Ben Ledi's northwest top. 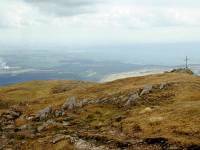 A simpler and less arduous walk from the northwest top to the main summit. I can see people by the trig pillar. Arrival at the main summit, at just after 1pm. 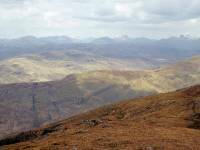 Summit panorama 1, looking out across the northwest top towards the Glen Lyon hills. 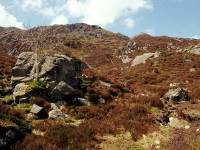 Summit panorama 2, looking north. The Stank Glen is in the foreground. 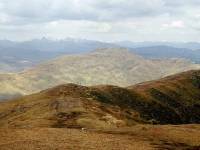 Ben Lawers in the distance. 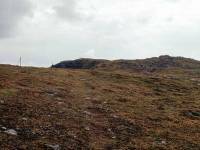 Summit panorama 3, the northeast view across Loch Lunbaig to Beinn Each. 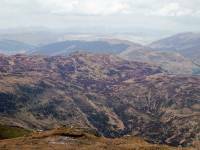 Stuc a Chroin is beyond and to the right. 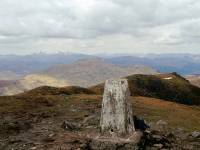 Summit panorama 4, east northeast across the col south of Beinn Each to an unknown valley beyond. 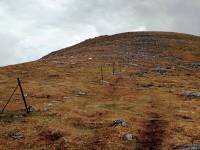 Summit panorama 5, eastwards across the Highland Boundary Fault. 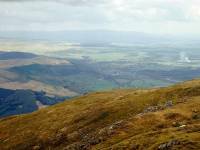 The Ochils are on the skyline to the right. Summit panorama 6, east southeast. 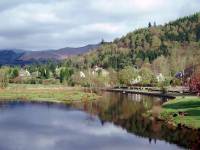 Callander is directly in view, and the old railway line is clearly seen. Doune Castle (immortalized as Castle Anthrax in "Monty Python and the Holy Grail") lies a few miles beyond. The Ochils fill the skyline and, hard to the right of them, you can see the two dark hillocks on which stand the Wallace Monument and Stirling Castle. If the day were clearer, we would be able to see Arthur's Seat in Edinburgh. 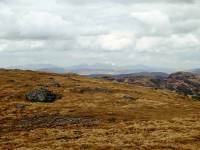 Summit panorama 7, looking southeast into the central lowlands of Scotland. Stirling Castle is right on the edge of shot to the left, with the glint of the Firth of Forth beyond. The Grangemouth oil refinery is pretty much in the middle, with Falkirk just to its right. Summit panorama 8, looking SSW. 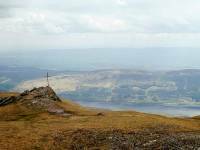 The cross is a memorial to a hillwalker, the lake is Loch Venachar. Summit panorama 9. Looking south, at the west end of Loch Venachar and the eastern shore of (I kid you not) Loch Drunkie. Summit panorama 10. 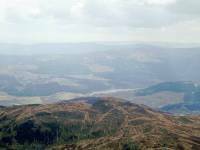 SSW into the Trossachs. Loch Drunkie is to the left. 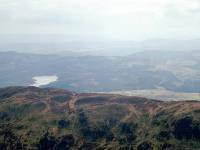 Summit panorama 11, looking SW across to Loch Achray. Summit panorama 12. looking WSW. 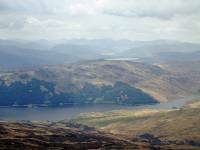 Ben Lomond appears on the skyline to the right of shot, and the Glen Finglas reservoir is coming into view at bottom right. Loch Achray is to the left. Summit panorama 13, looking west. 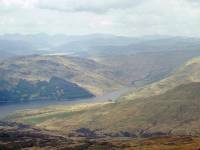 Loch Katrine is in view now, just to the right of centre. 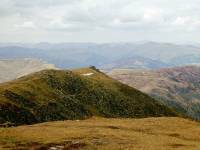 Ben Narnain is on the skyline directly above it, with the Cobbler just to its left, Ben Ime to its right and the Argyll Ben Vorlich to the right again. Summit panorama 14. 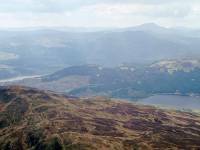 Looking NNW across the Ben Kinglas reservoir in the direction of Ben Vorlich. Summit panorama 15. 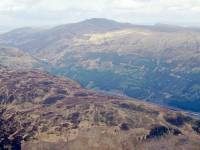 We're looking northwestwards to the Glen Falloch Munros. Summit panorama 16. 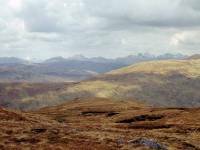 Ben More and Stobinian are the principal hills in view in NNW direction. 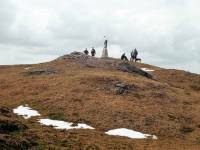 Summit panorama 17. More or less back where we started, looking across the northwest top towards the hills fringing Glen Lyon in Perthshire. Time to go back to Callander. Despite the Forestry Commission's closure of the path I've decided to ignore their advice and stick to the main route. 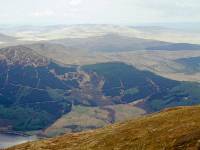 The "back door" to Ben Ledi is tiring and the terrain would be hell to descend. 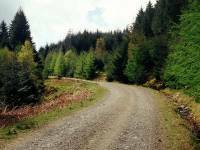 ...and then a left turn onto the path back through the forest to the foot of Loch Lubnaig. The descent through the cleared area was a little tricky but nothing like as bad as the trek back through the Stank Glen would have been. I was back in the hotel room just after 5pm.